My daughter is really into rainbows – like really into them. 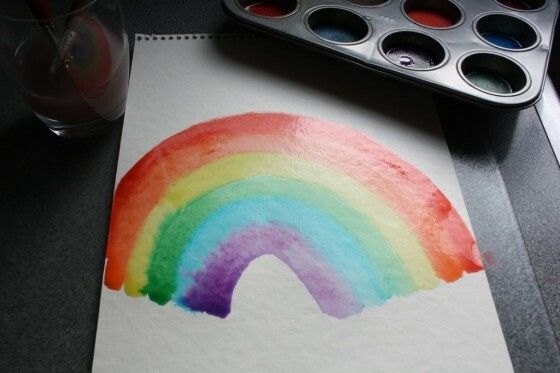 She draws rainbows everywhere. With chalk on walls. With paint on canvases. With pencils on paper. I always try to feed my children healthy snacks and what better time to do that then the start of summer. Well to be honest, the last month has felt like summer. Spring has totally been skipped in Sydney which is very alarming to me. But back to the rainbows. 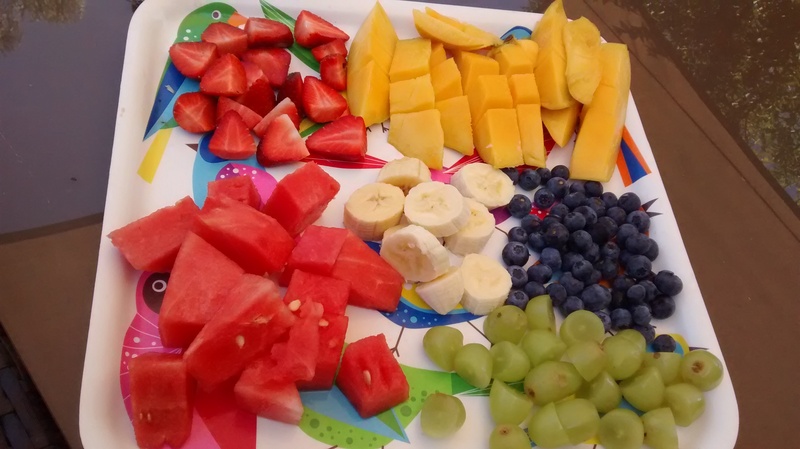 On Saturday, I decided to make a rainbow fruit platter. Examples: Tomato, Red capsicum, Radishes, Strawberries, Rhubarb, Cherries, Red grapes, Raspberries, Watermelon and Red apples. Benefits: red fruit and vegetables have lycopene. This is a powerful antioxidant which reduces the risk of some cancers and protects the heart. Benefits: Blue and purple foods get their colour from anthocyanin. The darker the colour towards blue, the higher the level of phytochemical. Blueberries for example are considered a ‘superfood’ and have the highest antioxidant activity of any food. The blue and purple foods are considered to help keep your blood pressure in check. Benefits: Green foods include a whole range of goodies, like chlorophyll, cartenoids, indoles and saponins. They have cancer fighting properties also. Benefits: These coloured fruit and vegetables have cartenoids, especially betacartenoids. They have anti-inflammatory qualities and are great for your eyes and skin and helps your muscles after exercise. Benefits: These foods contain a phytochemical called alicin (found in garlic) which have anti-viral and antibacterial properties. These foods also support healthy bones and reduces the risk of osteoporosis and reduces blood cholesterol levels. Many schools these days have ‘crunch and sip’ where children take in fresh fruit or vegetables to have during class time with water. This, along with lunches and recesses provide great opportunities to include a ‘rainbow’ in lunchboxes for children. There is a great website which makes this fun with lots of ideas for parents and teachers. ~ by em0navari on October 15, 2015. This entry was posted on October 15, 2015 at 11:20 am and is filed under Eating, Life Stuff, Uncategorized.You can follow any responses to this entry through the RSS 2.0 feed.You can leave a response, or trackback from your own site.